There should be a little “me-time” in everybody’s day. A few moments of indulgence for one’s self. My daily indulgence is almost always ice cream. DOVE® has just made that indulgence easier with their 70 calorie Ice Cream Miniatures. 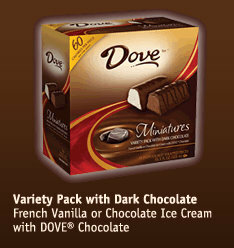 Dove® Ice Cream Miniatures are wonderfully rich and decadent ice cream wrapped in real Dove chocolate. Their newest flavors are Java Chip and Cappuccino but my all-time favorite is French Vanilla with dark chocolate. I think it promotes blissful meditation — yummmmmmmmmm. Dove Ice Cream polled over 400 busy wives and mothers and learned that an amazing 70% of multitasking women make the personal time every single day to indulge themselves for at least a few minutes. With that thought in mind, Dove® created their “My Mini Moment” contest. Dove® wants to know what your favorite mini moment of escape is. I don’t know about you, but those prizes sound more grand than mini to me! I think I’d be taking the spa services for a year. Which one would be your favorite choice? I love my home just the way it is. I don’t drink wine or spirits. So spa services all the way! Kala — yeah, spa sounds lovely! I´ve never had these before, but it sure sounds good. Betty — they are scrumptious! Tilden — since you aren’t a drinker I am thinking you just want to go because you love to travel. Their ice cream bars are really good.